From ultra-wide angles to super telephotos, the glass ceiling was shattered in Cologne. If the cameras at Photokina 2018 tended to be full-frame mirrorless models with eye-watering price-tags, the lens market proved itself to be far more real-world. Alongside glass for the new and soon-to-be-sold mirrorless cameras were third-party lenses for Micro Four Thirds and DSLRs, and from primes and macros to ultra-wide angles and super telephotos. Something for everyone? Here’s what went on to your audition list in Cologne. No new cameras from Sony were seen at Photokina, but it did use the occasion to show off its new E-mount lens for nightscape photographers, the FE 24mm f/1.4 GM. Going into its line-up of flagship full-frame G Master series lenses for its APS-C sensor mirrorless cameras (such as α6500 and α6300), it's got two XA (extreme aspherical) elements to prevent point light sources – such as stars – fro unnatural spreading. Just as crucial for astrophotography and landscape photographers, it weighs just 445g. It goes on sale in October for £1,450. 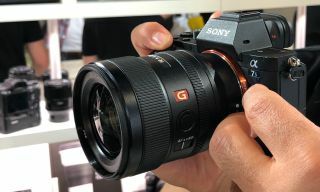 Sony also said that it would deliver 12 more E-mount lenses during 2019. As well as announcing a partnership with Leica and Panasonic in the L-Mount Alliance, Sigma used Photokina to unleash five new lenses. The highlight for wildlife, aviation and sports photographers is its versatile 60-600mm F4.5-6.3 DG OS HSM Sports lens; as well as super close-ups, it's also usable for wider shots. Sigma launched another, smaller telephoto, the 70-200mm F2.8 DG OS HSM Sports, as well as two in its Art range – the 28mm F1.4 DG HSM Art and 40mm F1.4 DG HSM Art – and the 56mm F1.4 DC DN Contemporary. After bolstering its GFX medium-format mirrorless cameras at Photokina with the GFX 100S and GFX 50R, it was only natural that Fujifilm gave word of its intentions about compatible lenses, road-mapping a trio of new GFX lenses to take the line-up to 11 lenses in total. The most welcomed will be the GF100-200mmF5.6 R LM OIS WR for launch in 2019, which can be paired with the GF1.4X TC WR teleconverter to boost it to 140mm-280mm. Also talked-up in Cologne was the GF50mm F3.5 R LM WR prime lens for release in 2019 – to become the smallest and lightest GFX lens around – as well as the mid-telephoto GF45-100mmF4 R LM OIS WR, which won’t see its first light until 2020. It's official, 2019 will see the debut of the Panasonic Lumix S1R and S1 full-frame mirrorless cameras … and lenses. Three lenses will be available at launch; a 50mm f/1.4 prime, a 25-105mm standard zoom, and a 70-200mm telephoto zoom lens. All of these S-mount lenses will use the L-mount system developed by Leica, which will now be supported by both Sigma and Panasonic. Plenty to choose from, then. Iconic camera-maker Hasselblad arrived in Cologne with a trio of new lenses for its medium format mirrorless camera, the X1D-50c. The headliner is undoubtedly the 80mm XCD 1,9/80 (£3,960); its maximum aperture is the XCD Series' widest yet at f/1.9, which could mean great low-light performance as well as brilliant bokeh. Joining it in Cologne was an all-rounder, the 65mm XCD 2,8/65 (£2,090) with a maximum aperture of f/2.8, and the 135mm XCD 2,8/135 (£3,090), which can stretch to a focal length of 230mm if purchased with the X Converter 1,7 (£3,690). All three go on sale in December, which will bring the XCD lens family to a total of nine lenses. So what if Photokina was all about the move to full-frame mirrorless cameras? Micro Four Thirds photography is alive and well and in need of a slew of new wide-angle lenses with night-scapes on their mind, according to Chinese manufacturer Venus Optics, maker of Laowa-branded lenses. Designed to to fit Olympus, Panasonic and Canon cameras that use the MFT mount, these Laowa lenses comprise the 17mm f/1.8 (which weighs just 160g), the astrophotography-centric 12mm f/1.8 (165g) and the ultra-wide angle Laowa 9mm f/2.8 Zero-D MFT (215g). The latter is already sold in Fujifilm X, Sony E and Canon EOS-M flavours. Laowa also showed off the brilliantly bizarre Laowa 24mm f/14 2x Macro Probe lens. Soon available for Nikon F, Canon EF and Pentax K mount cameras is this macro lens from Swiss company Irix. Its third lens after the super-wide 11mm and 15mm Blackstone and Firefly lenses, the Irix 150mm f/2.8 Macro – also called Dragonfly – is a manual focus-only lens, but with an extra-wide focusing ring that rotates through 270°. Featuring 1:1 maximum magnification and a minimum focusing distance of 0.35m, Dragonfly weighs 840g. Not sure what to use it for? The clue's in the name. Third-party lens-maker Tokina used Photokina to deliver a new premium prime lens for full-frame DSLR cameras. The first in its new Opera series, the weather-sealed 50mm F1.4 FF features ring-shaped ultrasonic motors for fast, quiet autofocus, as well as Tokina's new ELR lens coating. Available for both the Canon EF mount and the Nikon F mount, the Tokina Opera 50mm F1.4 FF will go on sale in November 2018. This is an incredible lens that, according to its makers, is a record breaker. Samyang reckons the XP 10mm f3.5 is the world's widest lens. It's 10mm and has been designed for full-frame DSLRs. Because of its shape, it offers a full-field rectilinear image. At this focal length, the lenses available are usually fisheyes so Samyang has managed something impressive here. The lens will be available in Nikon F and Canon EF mounts. The Tamron SP 15-30mm f/2.8 Di VC USD G2 is a fantastic upgrade from Tamron's previous SP 15-30mm f/2.8. Even though the original line-up is just three years old, there's a lot of reasons to get the new optics. The lens comprises an 18-element, 13-group lens stack which has an XGM (eXpanded Glass Molded Aspherical) element, as well as multiple LD (Low Dispersion) lens elements. These help banish distortion and also lateral chromatic aberrations.